As our society puts more emphasis on communication, people, including students, are given unavoidable opportunities to give presentations. When preparing a presentation or giving a presentation, we usually find that people are still using the “memorization” technique. Memorizing the script of the presentation is not a completely unsuccessful strategy, however our society wants our presentations to seem as natural and cohesive as possible. Ian Wells, currently a professor at Kookmin University, teaching Contemporary Presentation, believes that “knowing what you want to say, instead of memorizing” is the key to success for any presentation. Ian believes that memorizing the presentation has one major risk, which is if the audience does not comprehend the speaker; there is no room for changes or improvisation. In addition, he mentions that there are two factors that must be satisfied in order to give a perfect presentation: knowing what you want to talk about and understanding the audience. Audiences these days expect us to be relaxed when speaking in public. In that way, “our minds have more space for creativity, and seek opportunities to use humor.” Ian also mentions that when students are giving a presentation, they shouldn’t focus on making the presentation humorous or funny, because humor should be spontaneous. For example, while giving a presentation, the presenter suddenly thinks of something funny in his memory that is related to the topic of the presentation, then that idea could be used while the speaker is speaking. One of the techniques Ian uses when speaking in front of a crowd is the “belittling” method which is simply making ourselves look small and imperfect. It works most of the time, because this apparently allows the audience to relax, because they can think of the presenter as a human being who is prone to making mistakes. Before thinking about how to use humor in presentations, we all must remind ourselves that we are funny and if not, we can be funny. The most important thing about standing up in front of a crowd, and controlling the mood of the room is being confident about ourselves. Without confidence, we won’t be able to use any kinds of techniques while giving a presentation. The humor technique is not something that can be copied or memorized because it is so spontaneous and it comes from the speaker’s own mind and memories: basically from personal experiences. In a formal presentation, however, Ian mentions that trying to be funny while presenting should be considered in a serious manner. It is too risky to be humorous when presenting about a serious and controversial issue. 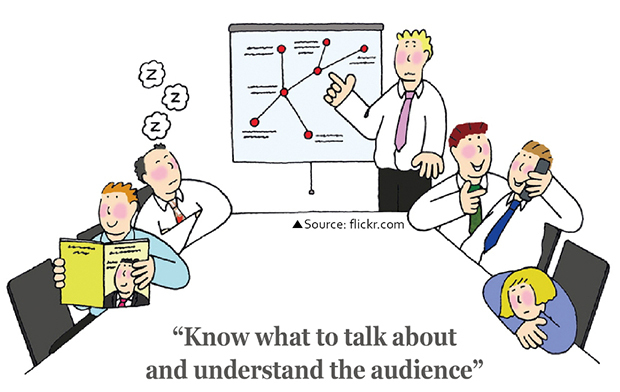 However, it all depends on the professors, managers or audience who are evaluating us as a speaker. Basically, we must acknowledge the fact that we should understand what kind of audience we have first, and we should know the overall content of the topic, in order to know how and when to use humor in the presentation. This way, students will be relaxed and have the time to personally learn and acquire the skills to give an affective presentation. Moreover, using the humor technique is merely a tool that can be used to enhance the overall quality of the presentation. It should only be used at the right moment for the right purposes in order to really challenge ourselves to improve the overall quality of the presentation.